Attention to detail is the cornerstone of the Aisling brand, whether it applies to a full room design or an individual signature piece. 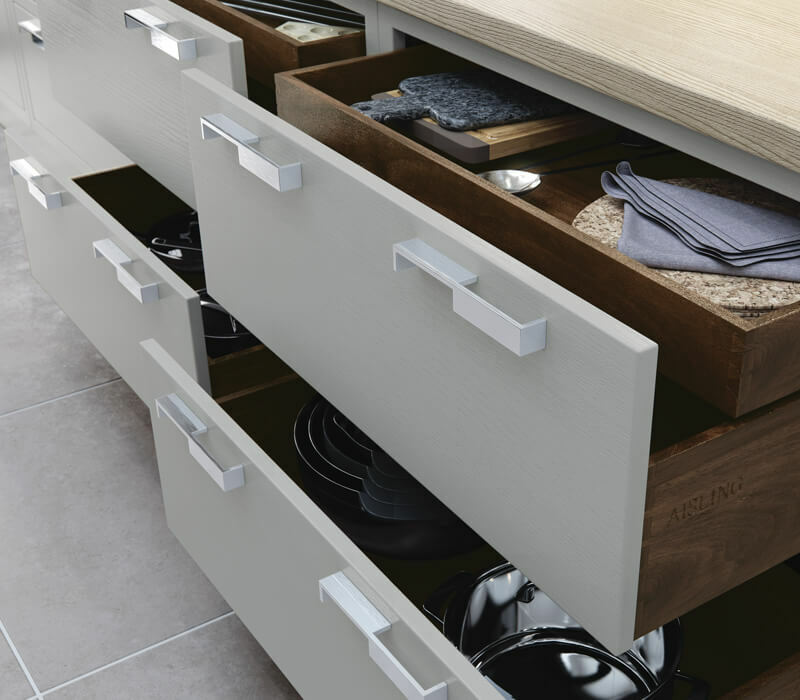 Manage your drawer space efficiently by choosing one of the many design solutions offered by Aisling Artisan Furniture. 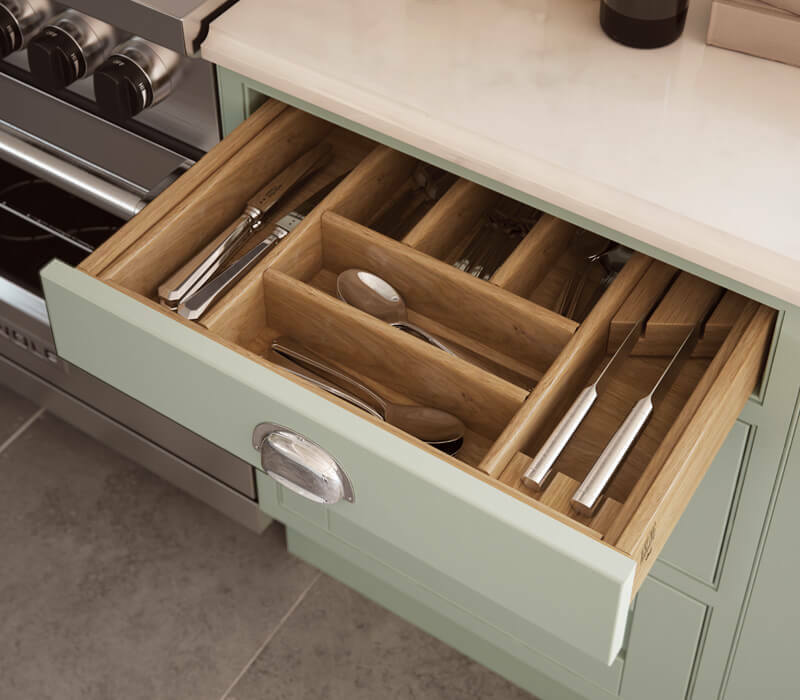 From cutlery inserts to pan drawer dividers, we have the answer to your organisational needs! Clever secret drawers create added storage, taking advantage of all the space available inside these Aurora pan drawers with dovetailed detailing and embellished with the Aisling branding on luxurious Walnut. 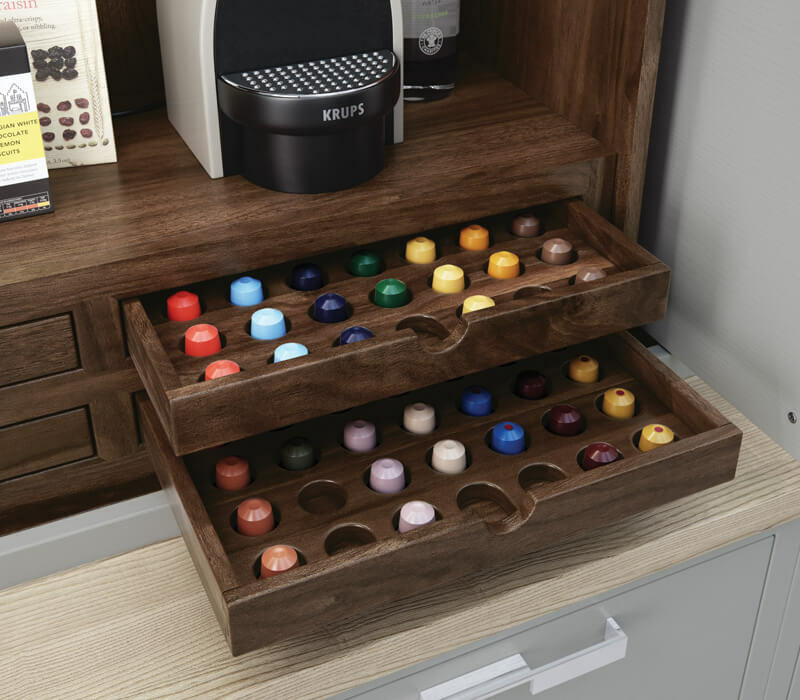 Designed to house Dolce Gusto and Nespresso coffee pods, these handy drawers sit snugly below your freestanding coffee maker. Keep utensils in their place with this solid oak, meticulously constructed cutlery insert, including knife block. 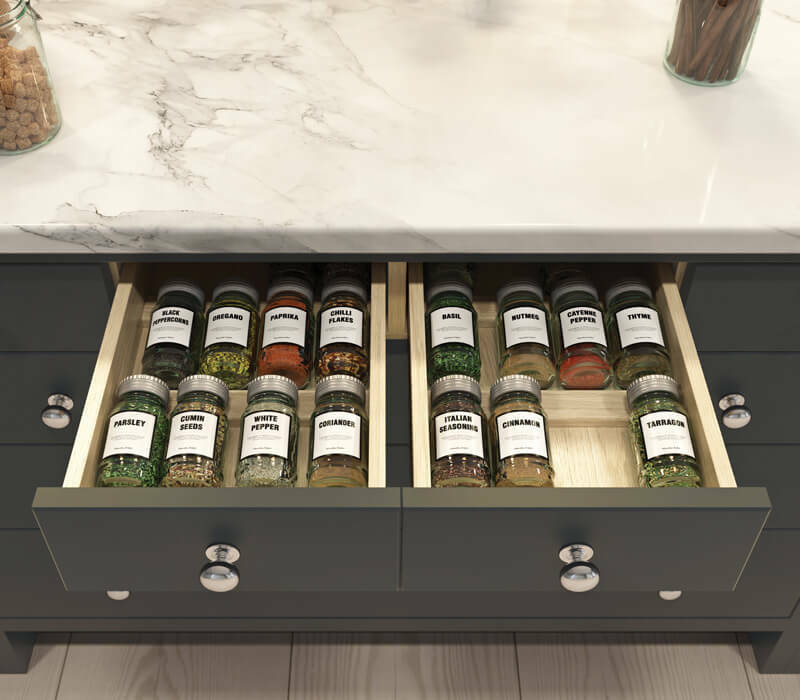 Keep your spices all in one place with this handy spice drawer internal. Also keeps spices fresher for longer by reducing their exposure to light. 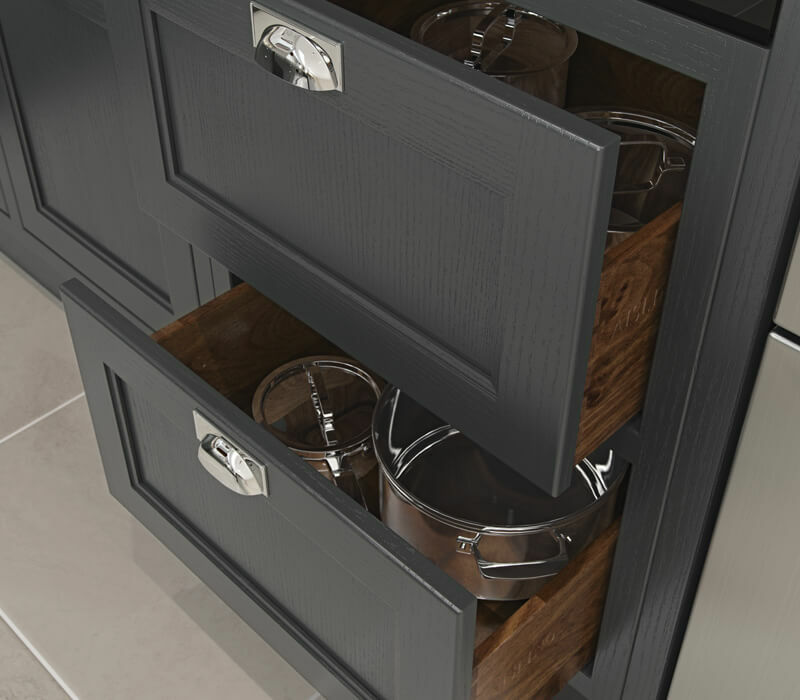 Drawers dedicated to pot and pan storage allow for easy access and organisation and are embellished with a carved Aisling logo. Don't hide your appliances, flaunt them! We have specially designed housing that will improve the look and accessibility of any of your appliances. 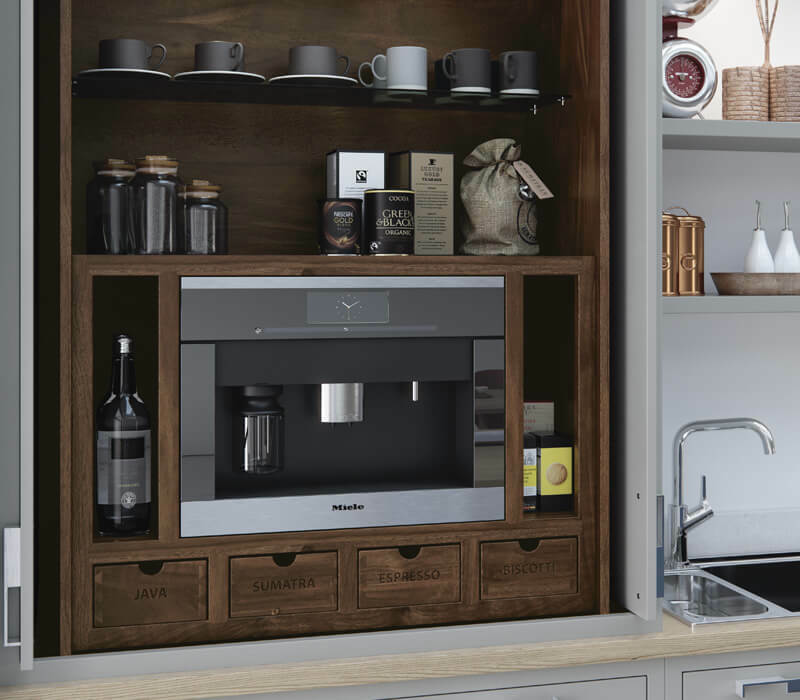 This dedicated space has been designed to house a freestanding coffee maker and all its accompanying accoutrements. 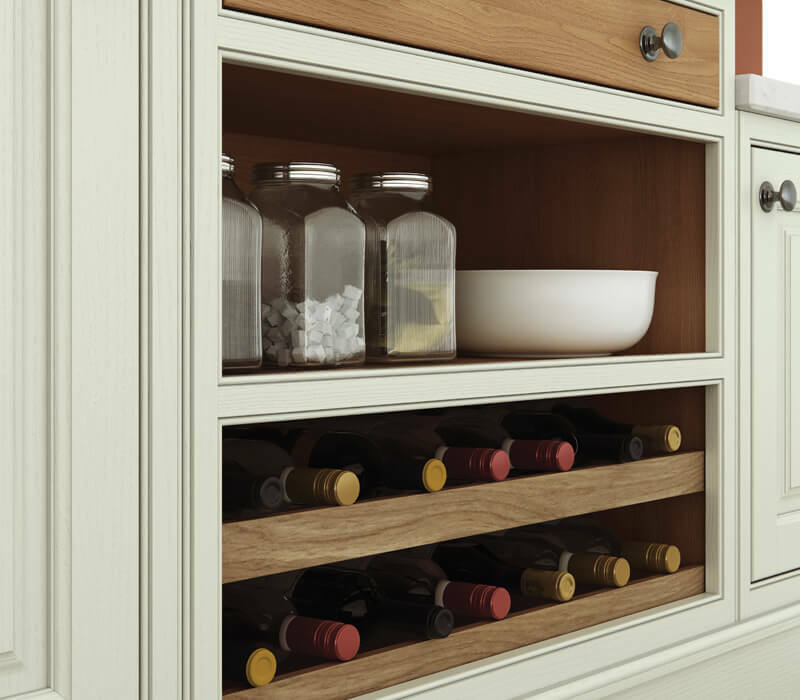 Pantry units and dressers provide the ideal storage solution for those who favour a well organized and efficiently run kitchen. 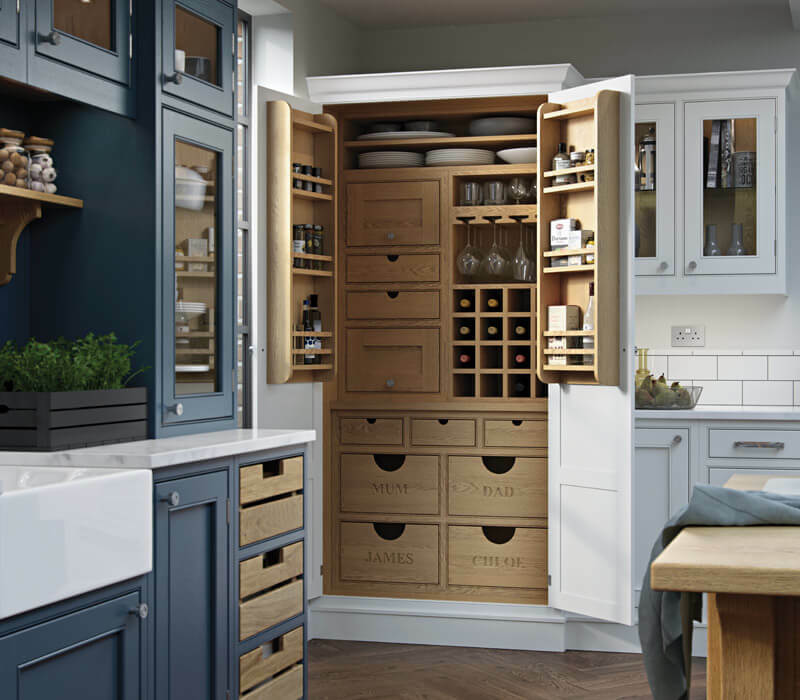 An abundance of storage options adorn this highly efficient hidden pantry unit including wine rack, bottle racks, open shelving and various drawers meticulously finished with carved labels and dovetail detailing. Nestled behind the concave facade of this neat corner unit lies a bespoke area for housing all your cocktail accoutrements including glass holder, inset chopping boards, bottle rack and concave, scalloped drawer fronts. 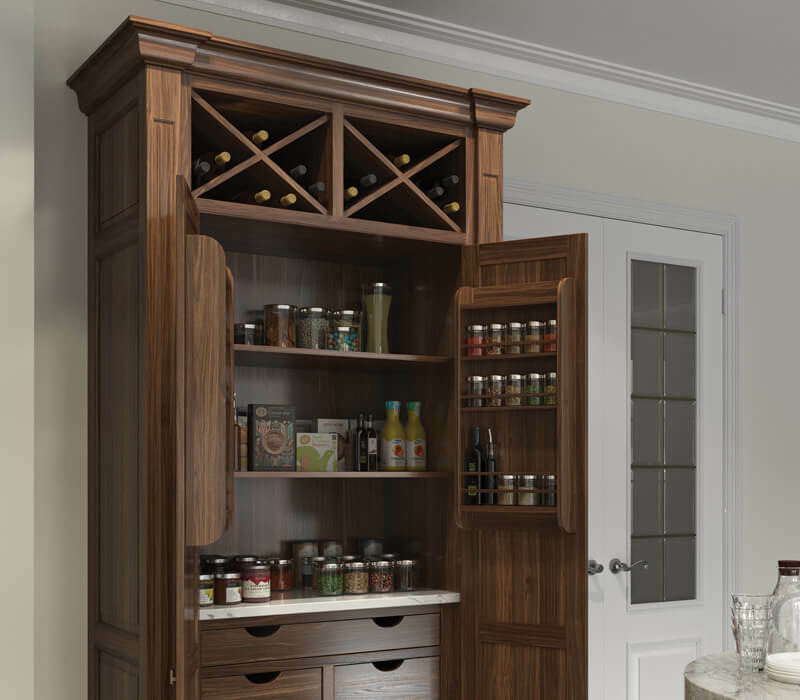 This meticulously appointed pantry unit includes wine rack, spice racks, various carved drawers with dovetail detailing and wine glass holder. 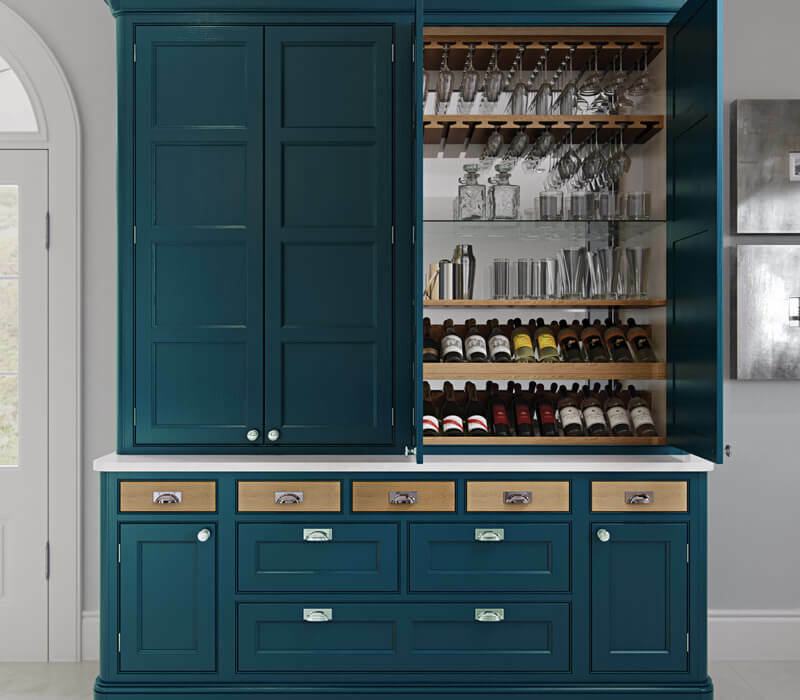 This stunning Molson dresser, with multi-panelled feature doors and solid oak drawers, contains a handy drinks cabinet equipped with wine glass holder, shelving, wine rack and mirrored glass back. 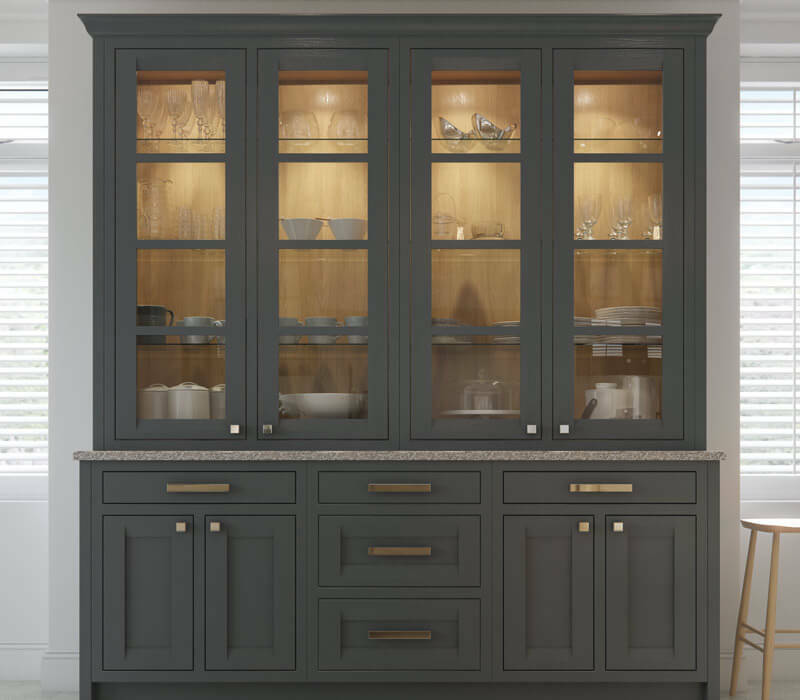 The sheer elegance of this Peterborough dresser, with its chamfered doors and drawer fronts and internal lighting, will bring a touch of class to any room, enhanced by the inclusion of Georgian frames. 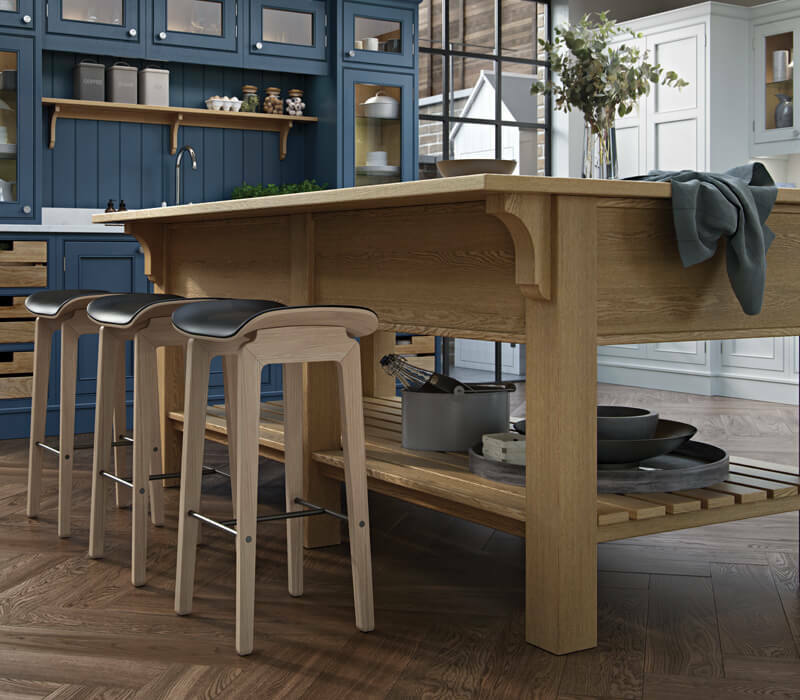 As the focal point of many kitchens, your central island or table sets the tone for style and functionality. 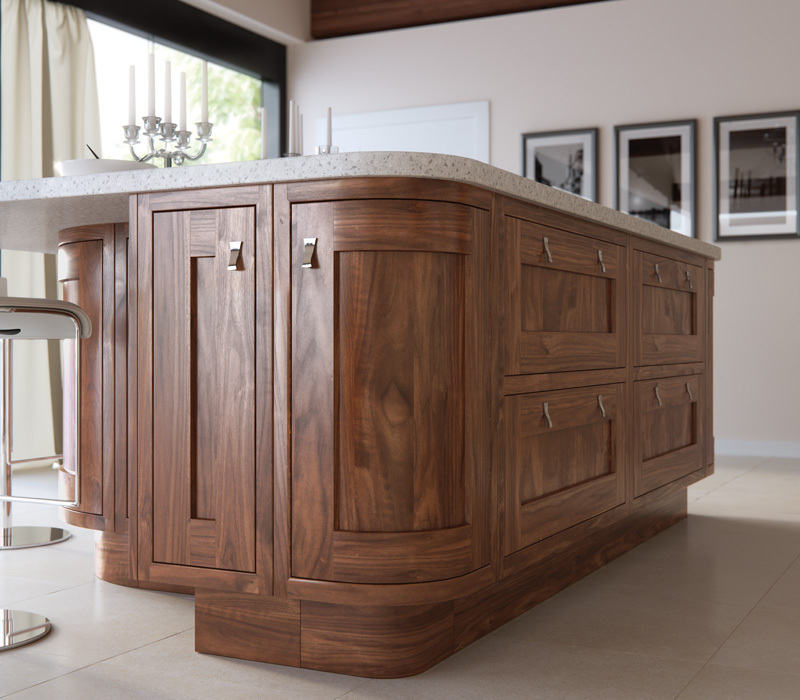 Take this opportunity to choose something special from our beautifully bespoke range. This luxurious circular end table, crafted from solid Walnut, can be used to embellish either one or both ends of your kitchen island. This farmhouse-style table with open storage area below and decorative corbals at each corner provides ample workspace for meal preparation and family get togethers. The eclectic design of the Montreal island, inspired by the chemist's shops of old, features countless drawers, leather strap handles, open shelf space and crate drawers, resulting in a breathtaking piece of furniture that offers both ample storage and aesthetic appeal. 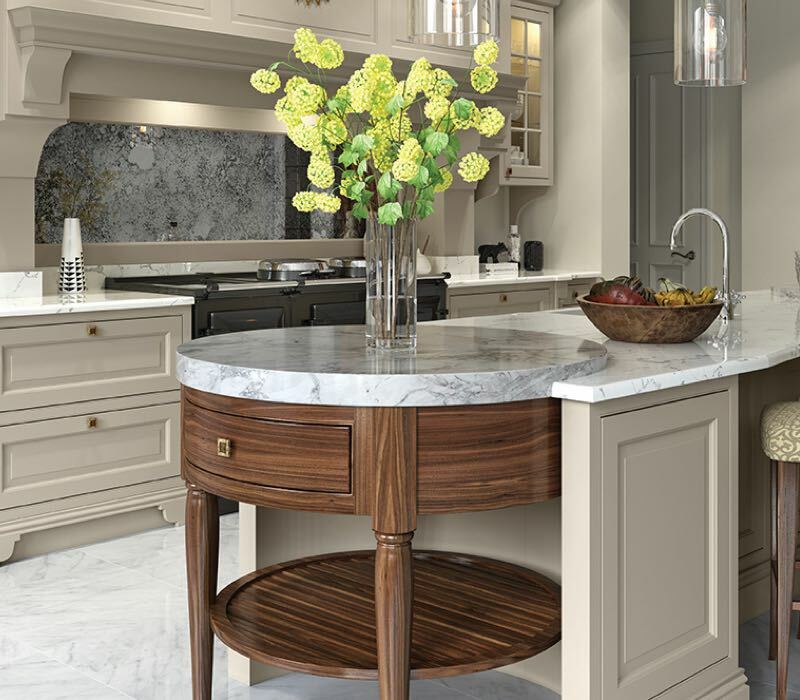 This design uses straight lines and curves to create the ultimate island unit complete with an abundance of storage space as well as a dedicated seating area. 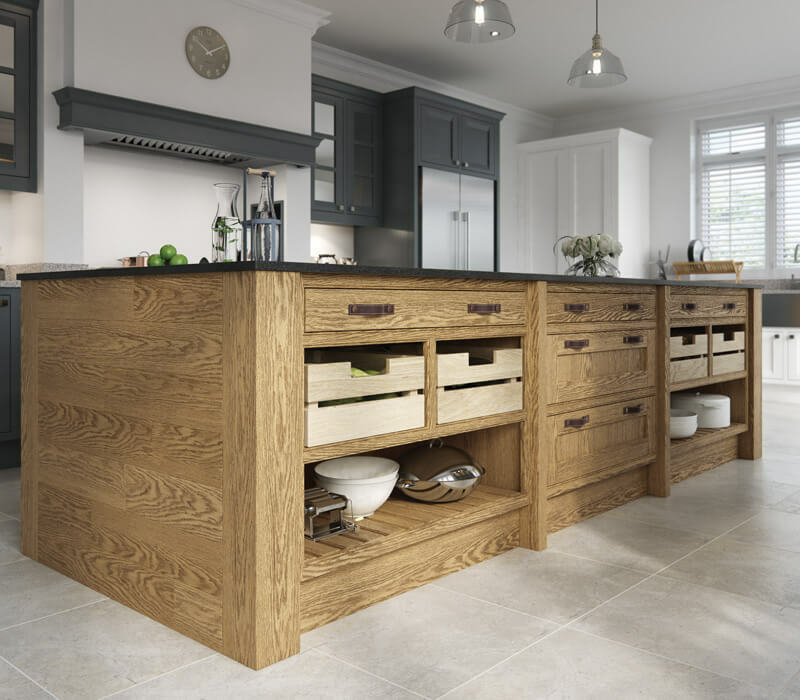 Never to be underestimated, proper design of your storage space can make a huge difference to how your kitchen operates for years to come. 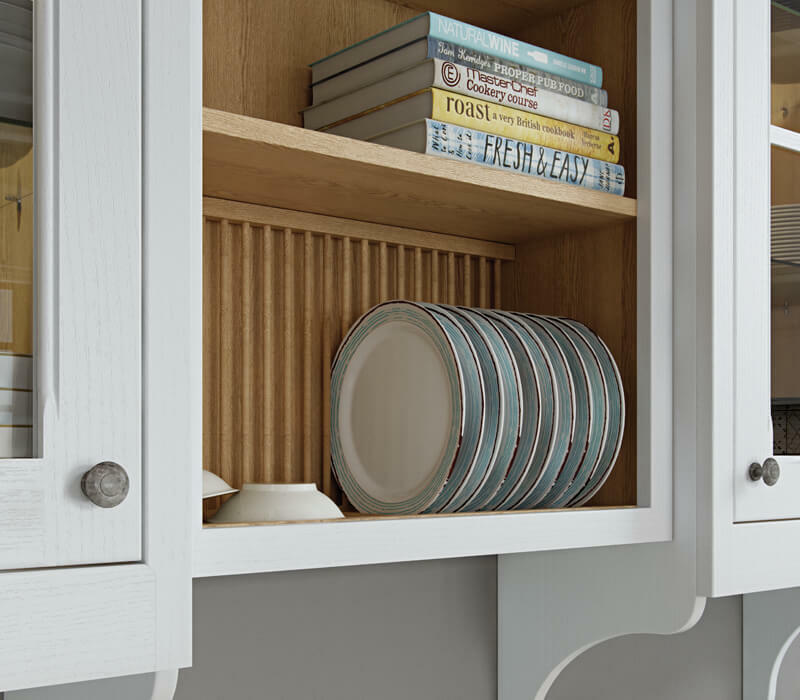 Aisling offers a multitude of storage options that will enhance your entire kitchen design and make your life easier. 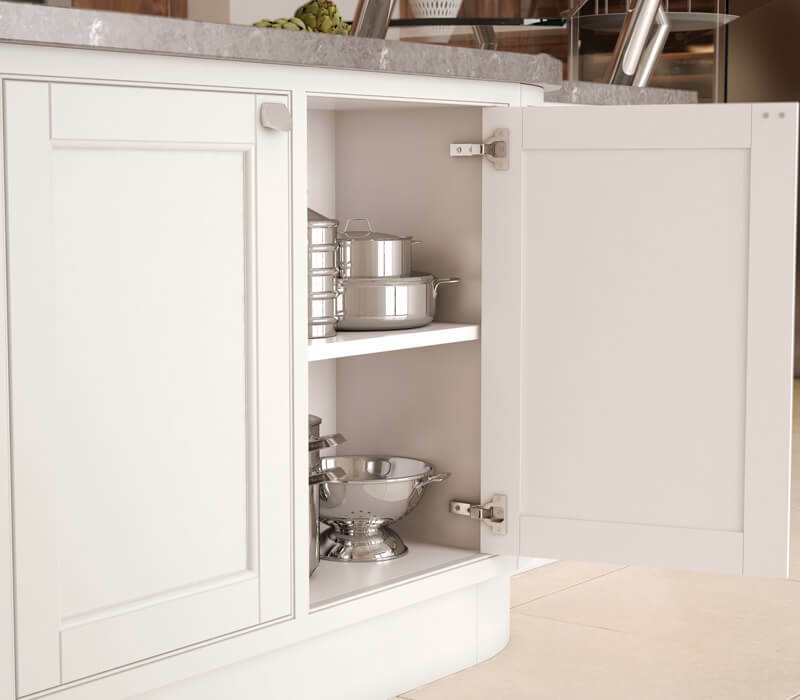 Be sure to use top quality hinges on all kitchen doors to ensure lasting durability and choose a soft-close option to prevent damage caused by door slamming. Use decorative glazed frames to show off your best glasses, crockery or treasured kitchen favourites. 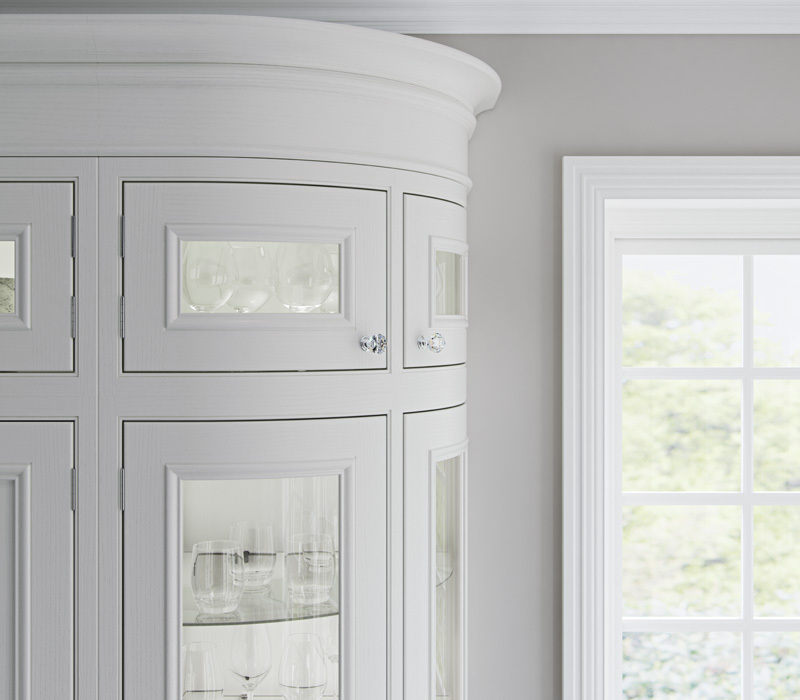 Highlight them even further with internal cabinet lighting! 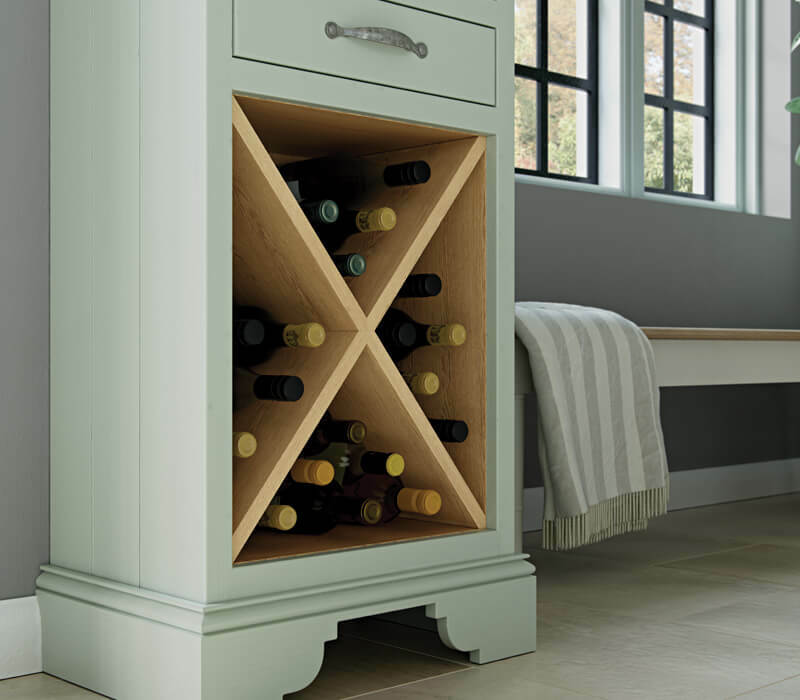 Easily accessible and simply designed, the X-box wine rack provides a different take on traditional wine storage. Show off your finest crockery in this highly accessible plate rack, featuring shaped gable ends below for an added flourish. 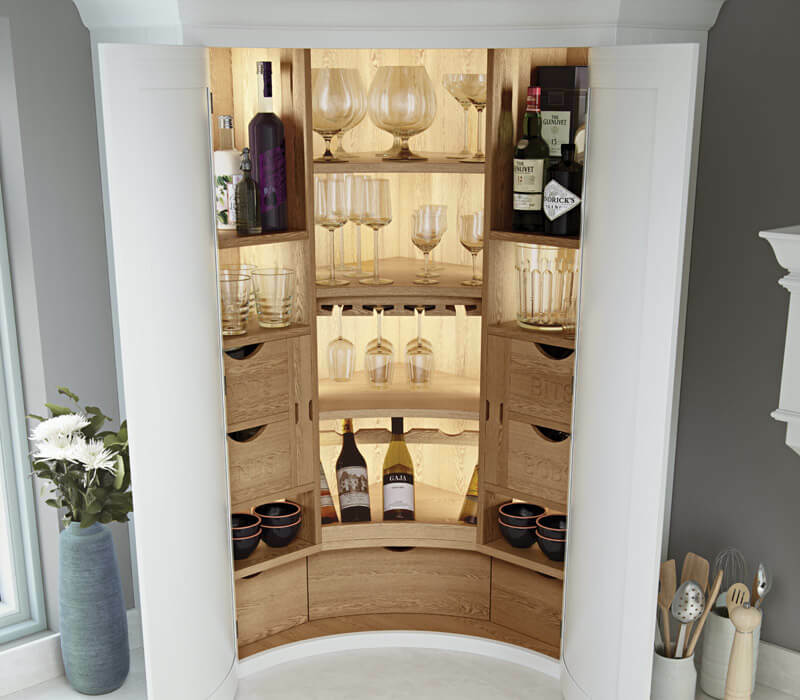 Sometimes simple design provides the perfect solution, like with this wine rack /open shelving combination. 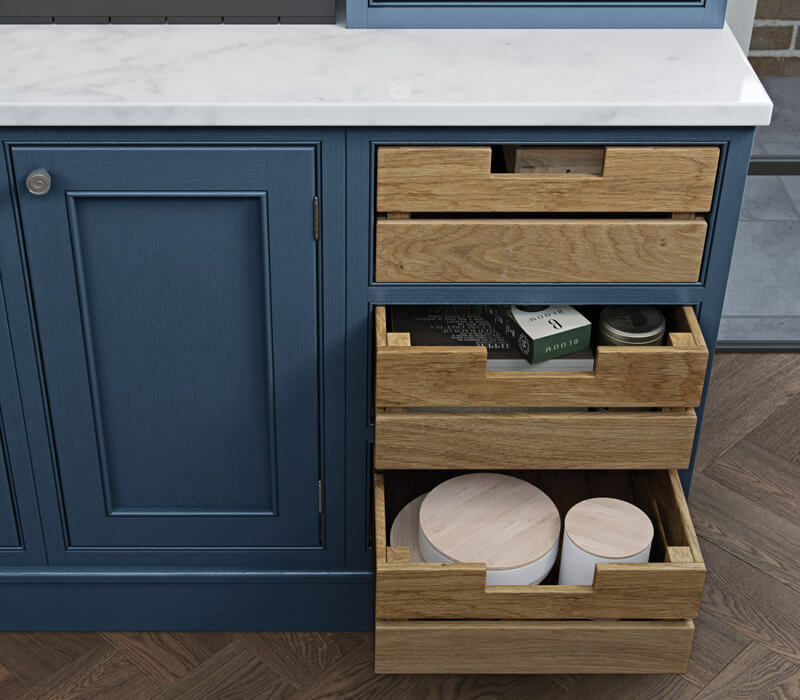 These crate drawers, crafted from solid oak, grace the Parisian Blue dresser bringing contrast and an overall rustic look and feel. 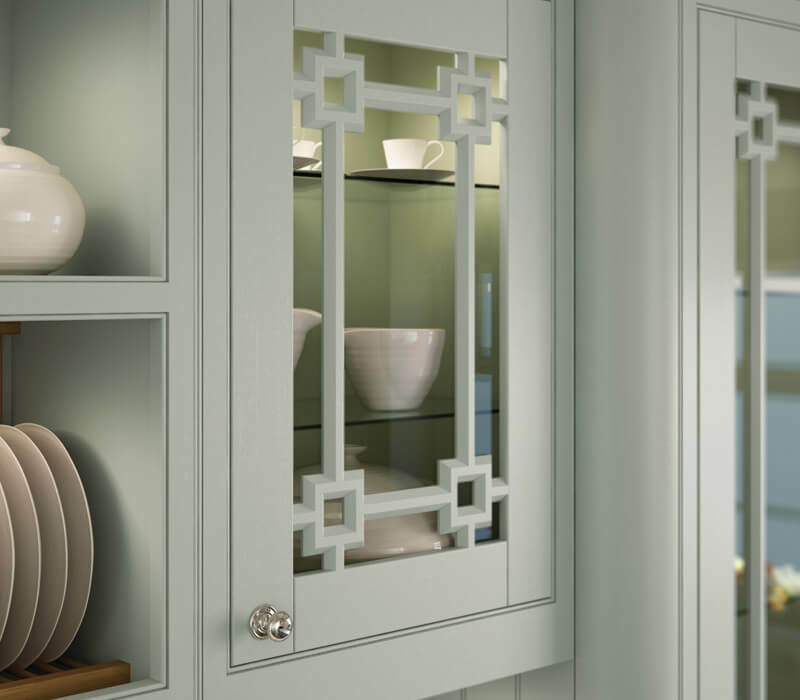 Bring your glass and crockery display to the next level with these unique Mackintosh carved frames. 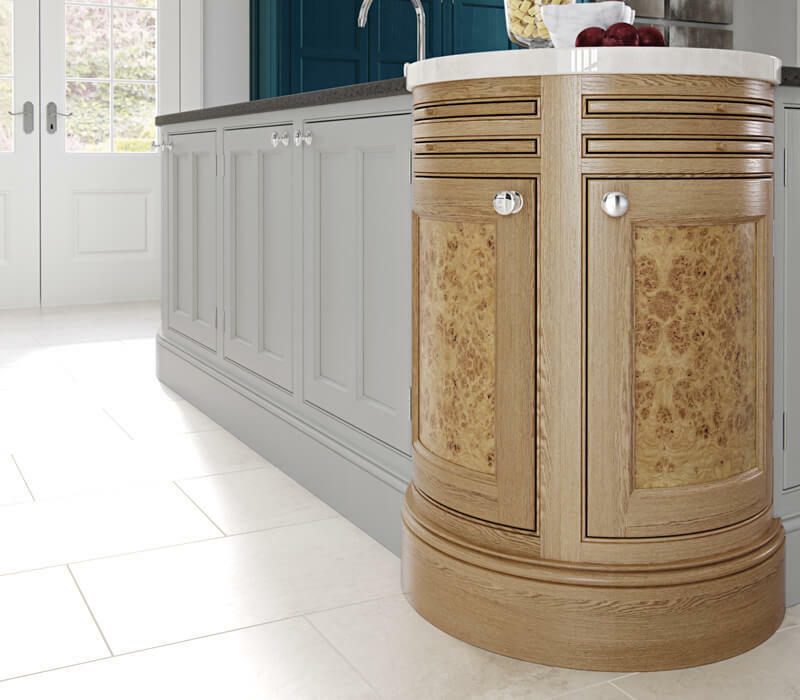 Not only does this compact barrel unit provide a feature focal point with its Burr Oak doors, it also offers practical added storage space at the corner of the island and includes integrated chopping boards. 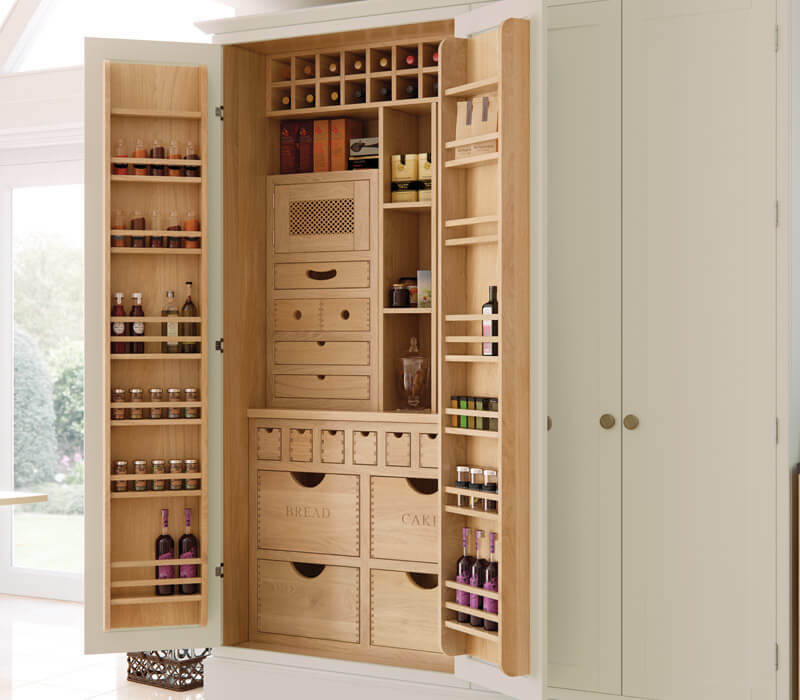 Store your spices in this handy spice drawer, easy to access and to organise. 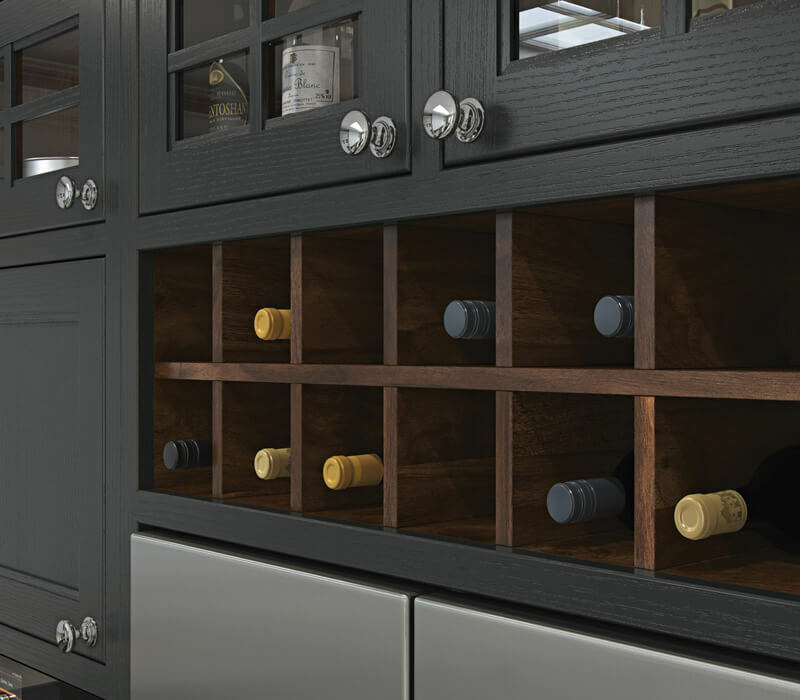 Rich Walnut dividers are used to create this integrated wine rack, placed conveniently above the refrigerator for easy access.